You know, when you’re plunking ahead on a project, then you get hit with a case of strep throat and possibly mono (but hey, you’re still waiting to hear back about the mono from the lab test from the doctor’s office so you’re not really sure you have it) but can barely pull yourself out of bed, all while on your 29th birthday, and you just lose steam? I had one of those weeks. 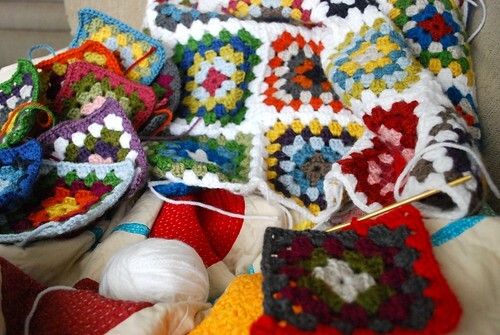 So how about some crochet? Let’s discuss. I got really wrapped up in wanting to make a Granny Square afghan last summer (what do you know…it’s another one of those started, then forgotten projects that I am SO GOOD at) and, surprise, surprise, it’s been sitting in a basket in my sewing room since last summer. It’s such an easy, mindless project that has been nice to have while I’ve been so sick. And I’m glad to be working on it again, because I really do like it. I’m just using basic acrylic yarn (Vanna’s Choice…not mine, however) and although I’m glad I’ll be able to wash it without problem, it makes me realize just how much I don’t like acrylic yarn. If I ever do something like this again, I’ll definitely go the way of cotton–if I want washablity, or wool. The acrylic is pilly and not very soft. It’ll work well to go at the foot of a bed, but not something that I’d like to cuddle up with on the couch in the winter. But, perfect for working on in between nap times. Do yourself a favor, and take a pass on the strep throat. You’ll be glad you did. Also, as a side note, I just wanted to add that I haven’t forgotten about the hand quilting tutorial, but it will be a little further off than I had originally planned. I’ll make a big deal about it once it gets a little closer though! Wow! 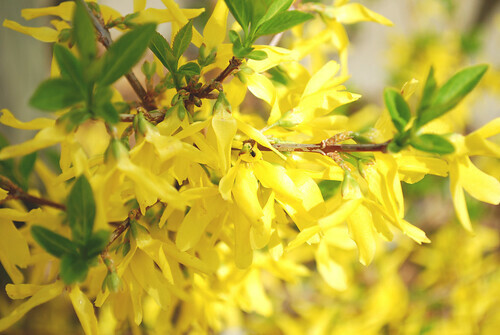 It’s been a big blog day for me today! 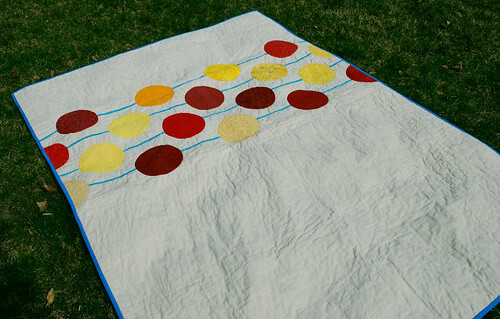 First of all, I want to say “hello!” to everyone who has stopped by today via the post about my Love Beads quilt on Sew, Mama, Sew! 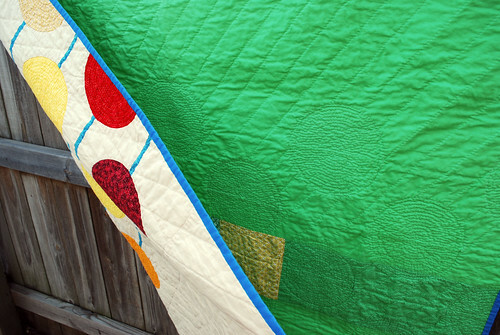 I was so excited to have my quilt chosen as one of their Quilts of the Day for their Quilting Month II! It’s very cool for me to think that people outside of my little world think that something that I made was good. I try so hard to remind myself that the most important thing is for me to be happy with my work, but when I hear it from others, it’s almost overwhelming. I really thank you all for each kind word you have to say! Know that you all have made my day! 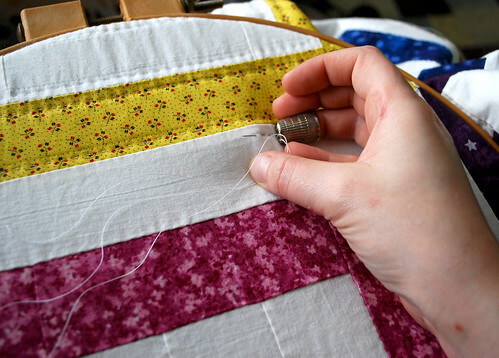 And as for that hand quilting tutorial, I am so jazzed that people are into it! I think my plan will be to get my next quilt (another of my Finish It or Pitch It projects–this one’s been in progress since, oh, 2005!) ready to sandwich in the next day or so. I’d like to have a clean slate to use, just so it’s easy to show and for you to see. I should stress though that I’m no professional. 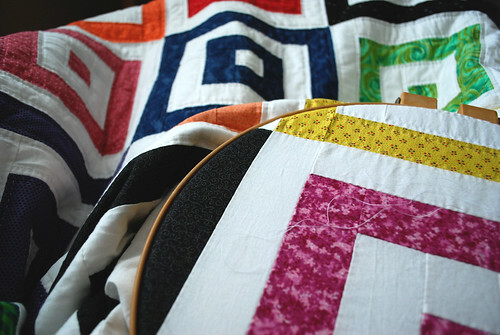 All that I know about hand quilting has been through a few books and lots of trial and error. But, I think it’s one of those things that once you understand the basics, it’s okay to make up your own rules as you grow more comfortable. Keep an eye out early next week for it! 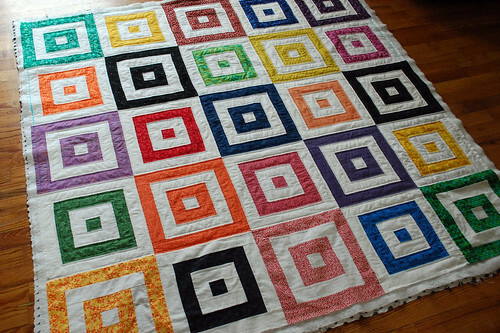 Thanks to having a week off from work last week, I am nearly done with the hand quilting on my Bright Squares quilt. Just four more blocks, plus the binding (my least favorite) to go. I’m still pleased with my choice to rip out the machine quilting–just for the fact that the quilt lays flat when it’s spread out on the floor. It seemed crazy at first to do it, but I’m glad that I made the decision. And thinking about hand quilting, I wondered if I were to put together a hand quilting tutorial, would anyone be interested in it? It seems that many more people machine quilt (which yes, I would like a good tutorial, thank you very much) their projects, and maybe it’s just because they’re afraid to try hand quilting. Interested? Let me know. I’m thinking it might be fun! Seeing as though I’m still riding high on the feelings of having finished a big project, all I can think about now is keeping my momentum going and finishing more quilts. In fact, I had one in mind that I had started last year and thought would a make for a quick finish. Then I stepped into my crazypants and made a simple project into a much, much bigger one. I had started machine quilting this last year, and when started working on it again, I just felt like it was so lousy compared to what I had just finished doing. 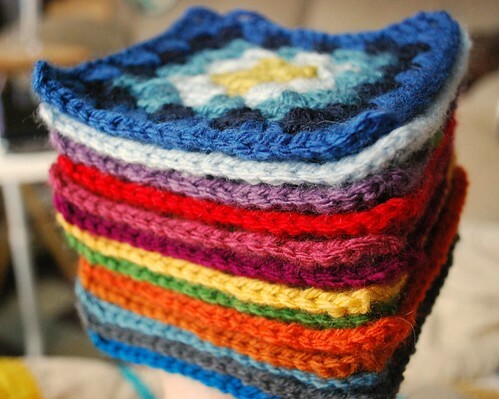 My stitches were uneven, the tension was terrible, and I just felt like I had to start over. Hello, seam ripper. You are the one tool that I both loathe and love at the same time. I guess it makes sense to hand quilt this, especially since it’s the last top that I pieced by hand. Back when I first started quilting, I didn’t have a sewing machine, so I learned to piece by hand. Now though, I don’t spend the time hand piecing because I don’t really feel like it adds that much to the finished quality of the quilt. Sure, I’ve spent an extra 10,000 hours on it while I sew everything together, but you can’t really see it once it’s all finished. I’d rather use my machine to piece (which is often more precise than I could do by hand) and spend the time to hand quilt. I’m happy with how my quilting is starting to look now, especially compared to the way it looked with all those mistakes. I don’t think the mistakes were terrible, but I just felt that it was a waste of my time to finish something that I thought was so shoddy. All that time it’s taken me to make this, I’d just be so upset to think that it could have turned out so much better. The only thing that really disappoints me about ripping all of this out is that I feel like I really failed at machine quilting. I know it’s my first real attempt, but even after some practice, I just felt that I couldn’t get the hang of it. Before I make another serious attempt, however, I’d like to take a class so that someone can actually show me what I need to do! After a tense trip through the wash last night, The Quilt is complete! I could not be any happier with it. I ended up picking a solid turquoise Kona cotton for my binding, to match the turquoise print that I used for the lines between the beads. It’s so simple, but it does a nice job of making the lower half of the quilt not feel so boring in all of it’s off-white-ness. At first, I wished that I had more of the print to use for the binding, but it’s been years long gone. Once I found the close match in the Kona, it seemed like an obvious choice to go with a solid. I’m very pleased with it. 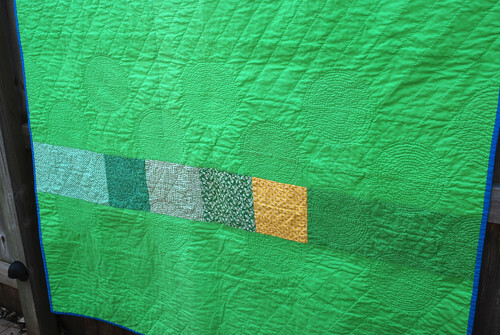 I’m also really pleased with how the quilting in the circles came out after the wash and dry. 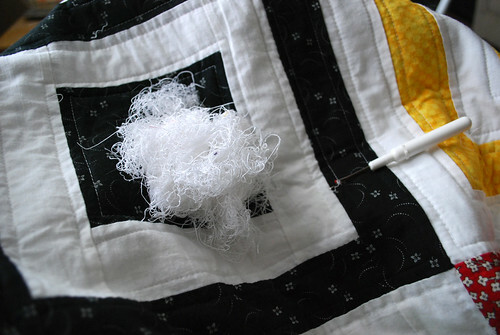 I was nervous that since I used such tight quilting lines that there was the possibility that I’d get some nasty puckering. 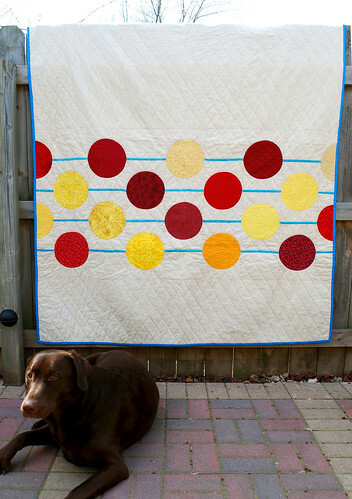 I got lucky though, and the circles look fantastic both on the front and back of the quilt. 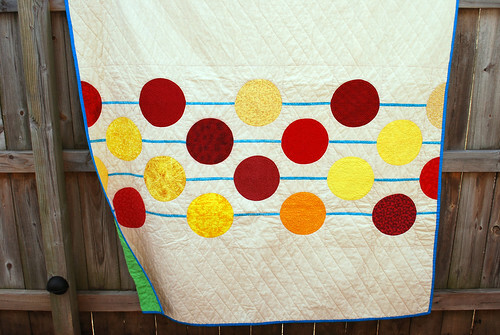 I also love how it feels–the mass of quilting makes this so much more tactile than anything I’ve done before. Last night’s washing wasn’t without a little drama though. I added a smidge of Downy to the wash to soften things up, but after it finished drying, I realized there were about a half a dozen little Downy stains all over the bottom of it. I scrubbed the spots with some detergent and sent it right back through the wash. So far, all the spots seem to have faded, but it’s certainly not the first thing you want to find on your finished project. I am so happy to have this completed. 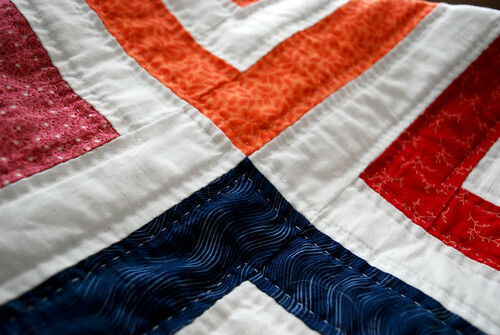 It’s renewed an interest in finishing quilting projects that I’ve had sitting, waiting for me for several years. 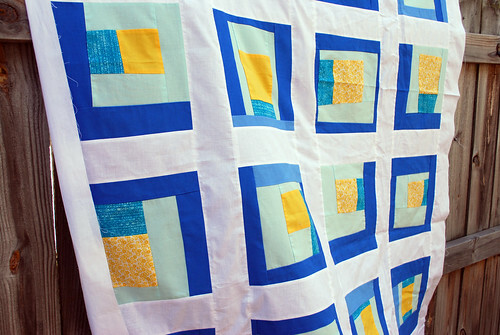 The time I spent hand quilting were relaxing and enjoyable again. To be this excited about finishing this project and moving on to more is well worth the time it took to finish this.